The ultimate adventure! 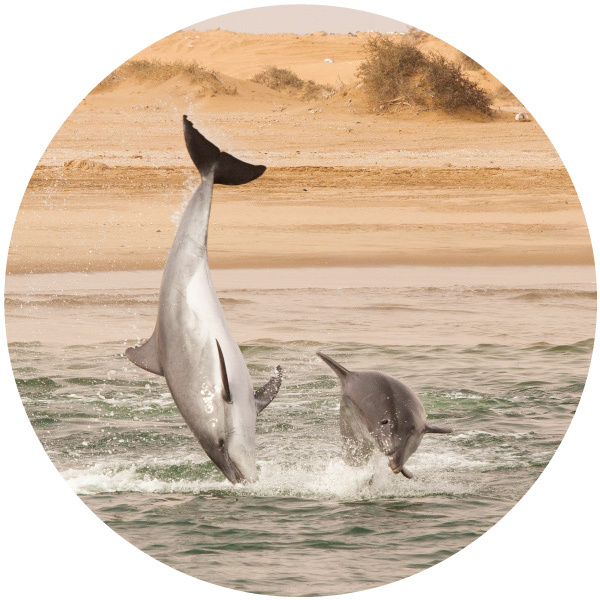 Visiting Namibia, you want to see it all, from the deep south to the far north. 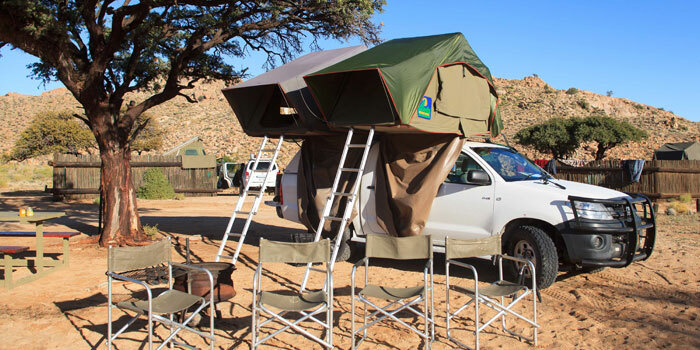 After crossing the stunning red Kalahari landscapes, you will reach the majestic Fish River Canyon as the absolute highlight of southern Namibia. 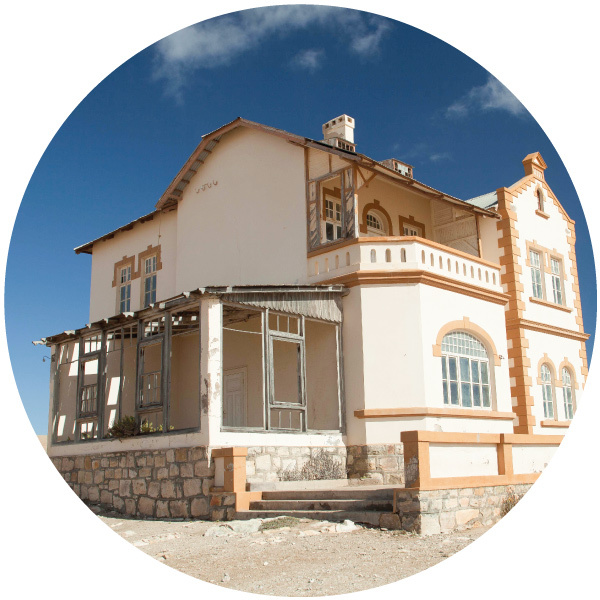 Along the Atlantic Coast you wander through the harbor towns of Lüderitz and Swakopmund. A kayak or catamaran are the perfect means to explore life at the ocean. Of course, climbing the world’s highest dunes at Sossusvlei is a must-do! In the vast, rough landscapes of Damaraland and Kaokoland in the north, you will encounter Namibia’s cultural heritage of ancient San rock paintings and traditional Himba villages. 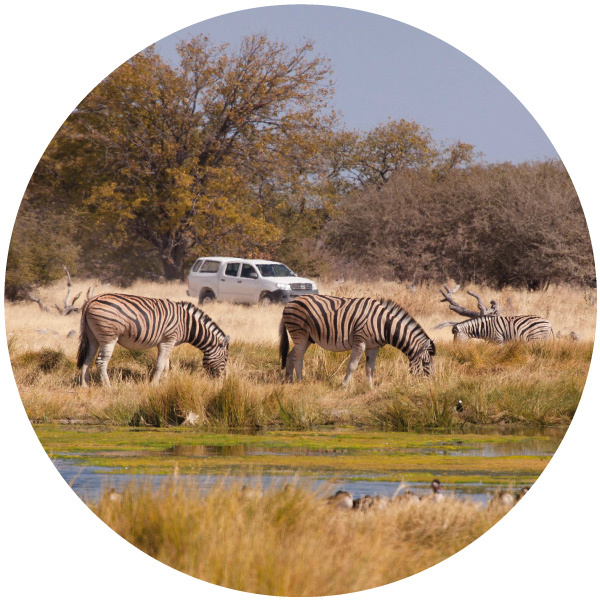 Your African adventure is only complete when you also visit the Etosha National Park. Spotting wildlife while driving through the park is a great experience. 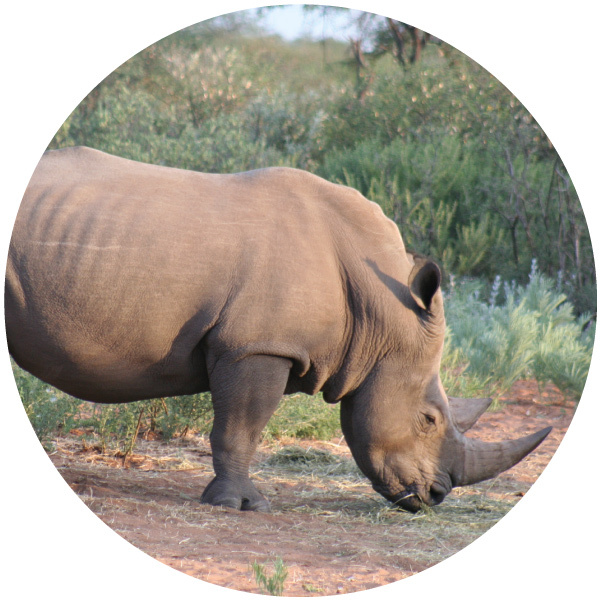 You will be amazed by the large number of wildlife in Etosha National Park! End your trip with an amazing hike at the Waterberg Plateau. After arrival in Namibia you will spend a night in Windhoek. This will give you the opportunity to acclimatize, walk through the city center and prepare for the next day. 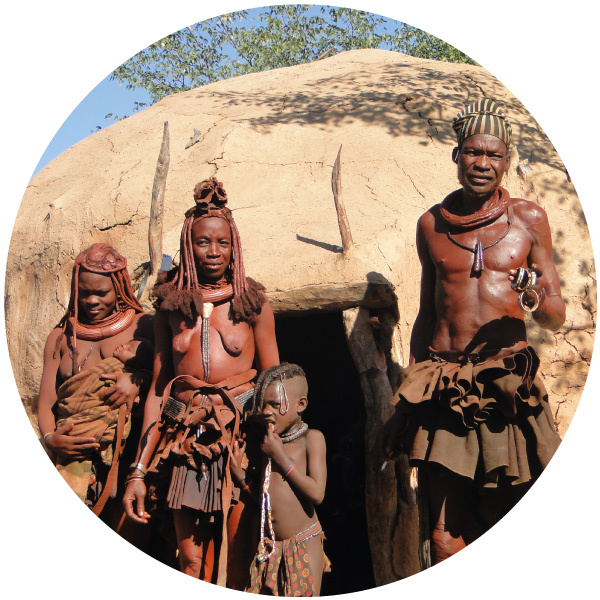 Your adventure begins in the Kalahari Desert, home to the San-people for a long period of time. Although its name means “great thirst”, the Kalahari does attract plenty of wildlife. During a sunset safari you will be able to look for the animals on top of a dune, enjoying a cool drink, while this semi-desert uncovers itself in its most beautiful colors. 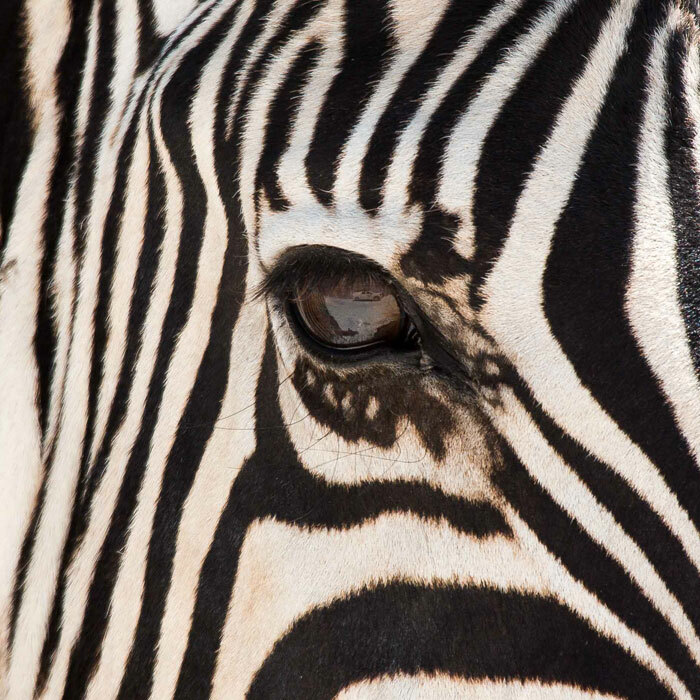 Keep your eyes open for springboks, zebras and wildebeests. End the day while gazing upon the star-studded sky. 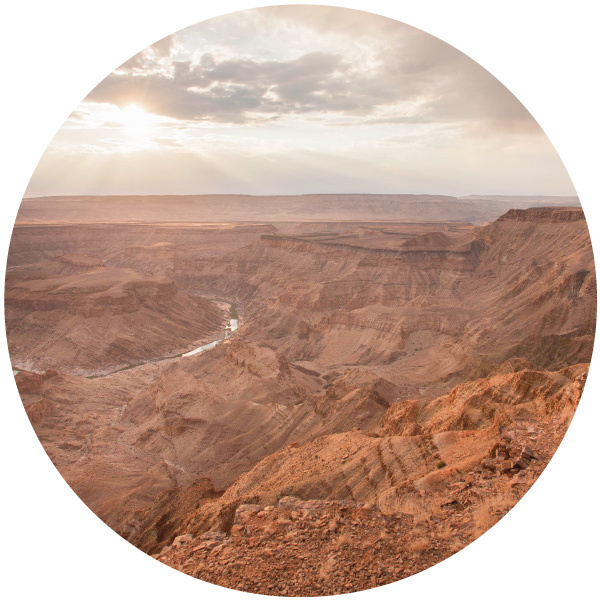 In Namibia's far south, you will encounter an amazing natural phenomenon: the Fish River Canyon. About 650 million years ago, plate movement formed a lowered area, along which the ancient Fish River could flow and eventually erode a flat plain, which is today's start of the canyon. Where the surface suddenly comes to an abrupt end, the ground drops for a vertiginous 500 meters. There, meandering between the high rocky walls, runs the 650 kilometers long Fish River that is on its way to the Orange River, the natural border with South Africa. From several viewpoints, you will have spectacular views over the Canyon. At Ai-Ais you will find natural hot springs. When you are in favor of a good hike, we can plan a stay in a lodge offering guided hikes. While staying in Aus, you can visit the coastal harbor town Lüderitz: a village that experienced its most wealthy years during the diamond-rush between the world wars. A visit to ``ghost town`` Kolmanskop will certainly leave an impression: what once was a wealthy mineworkers’ village with a casino, theatre, shops and villas, was taken over by nature soon after the town was abandoned in 1954. The desert's sand got free rein, and what is left is a bizarre sight, and a heaven for photographers. 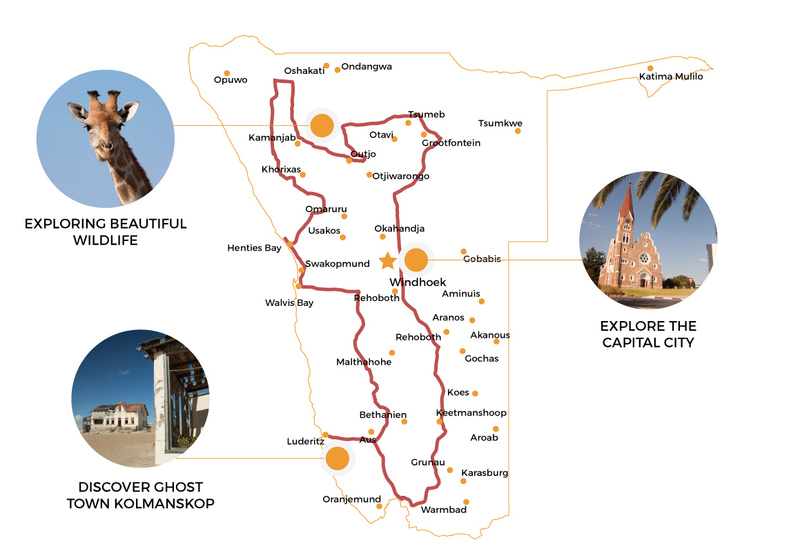 Stay 1 day extra in Lüderitz to visit Pomona and Bogenfels, or to do a boat tour to Halifax Island. Pomona is another abandoned mining town, but less touristy than Kolmanskop, and was in its heyday a German village home to about 1000 people. Bogenfels is a 55 meter high rock arch that stands firmly with one foot in the ocean and the other in the sand of the Namib. Halifax Island can be visited with a catamaran, where you will see African Penguins in their natural habitat. 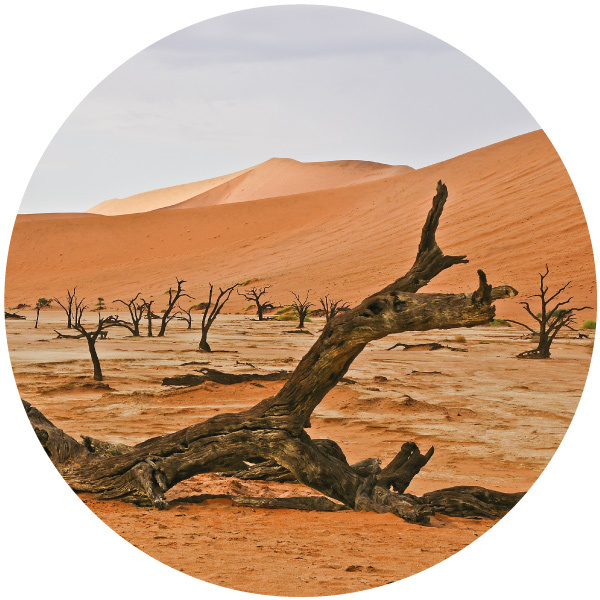 Red dunes, distinguished from each other by sharp lines, an eye blinding white salt pan and scorched black trees… Sossusvlei is probably the most well-known image of Namibia, and cannot be missed in any trip. The shapes and contrasting colors make it almost seem surreal. Climb some of the world's highest dunes for the most spectacular sunrise and sunset, a feast for the eye! This part of the Namib-Naukluft Park is called the “Namib Sand Sea”, as far as you can see there are dunes of red sand. A late afternoon sundowner drive and a visit to Sesriem Canyon are definitely worth doing when you want to explore the surroundings of this oldest desert on earth. The Atlantic Coast has a lot to offer. While enjoying a nice sea breeze, explore the marine life while joining a kayak tour or catamaran cruise to meet seals and pelicans, and maybe even dolphins! Go into the dunes for some adrenaline: what would you think of sand boarding or quad biking? The coastal town of Swakopmund is still showing some influence of colonial times represented in architecture and language. It is a small village with a small but pleasant boulevard with some nice restaurants and terraces and several lunch rooms with an international taste like Village Café. Before leaving the coast, you can make a stopover at Cape Cross: seals are lying along the coastline for as far as you can see! When heading north, the landscape changes when entering beautiful Damaraland, where an enormous mountain emerges: the Brandberg. It is the highest mountain of Namibia and best known for its ancient “White Lady“ rock painting. The ancient landscape is scattered with giant boulders that hide the area’s main secret: the more than 2,500 rock engravings of Twyfelfontein. 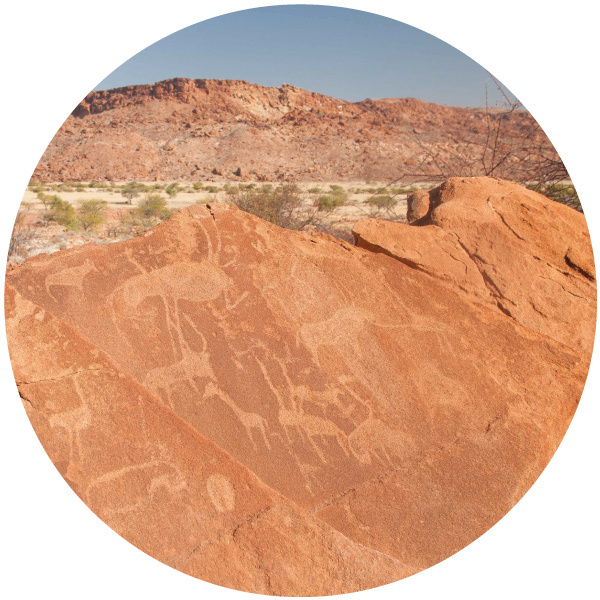 Once made by the San people, these engravings informed San tribesmen about nearby waterholes and predators. 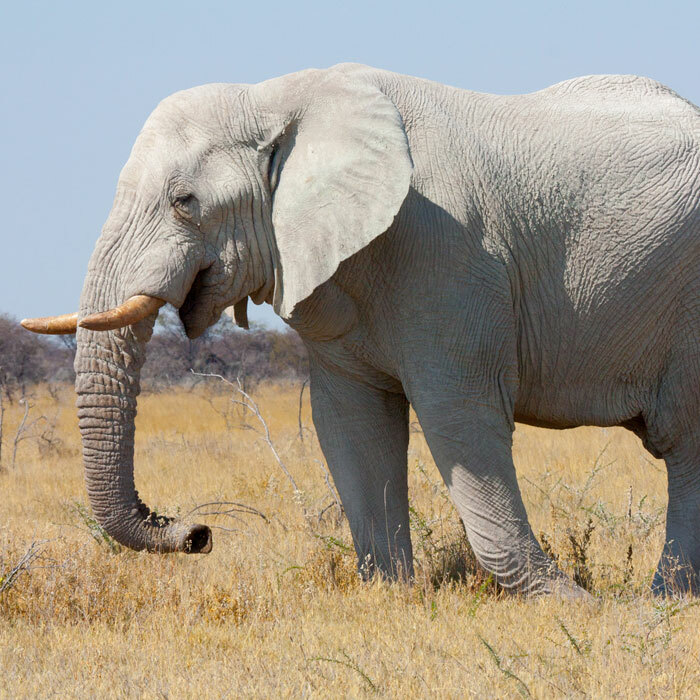 If you are lucky, you might bump into the largest inhabitants of the area, the mysterious desert elephants. These beautiful animals have remarkably adapted to the harsh conditions of the desert. 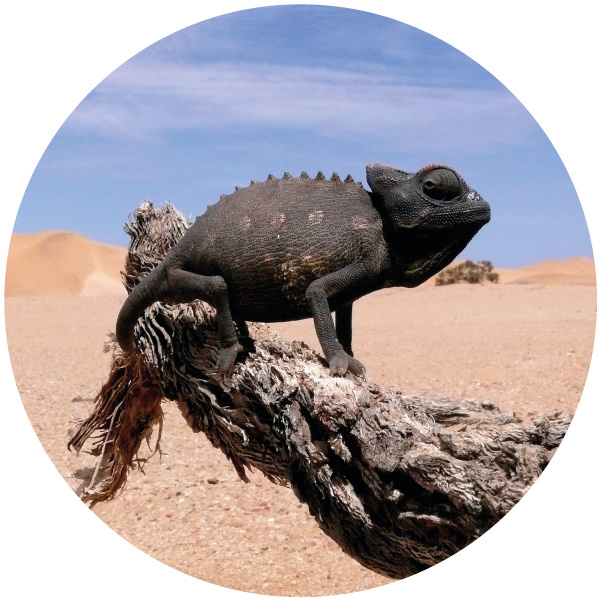 Kaokoland is also known as Namibia’s last wilderness, and is home to the Himba people. Time and modern ways seem to pass by their traditions: many Himba people have an authentic, nomadic lifestyle where life is organized around cattle. 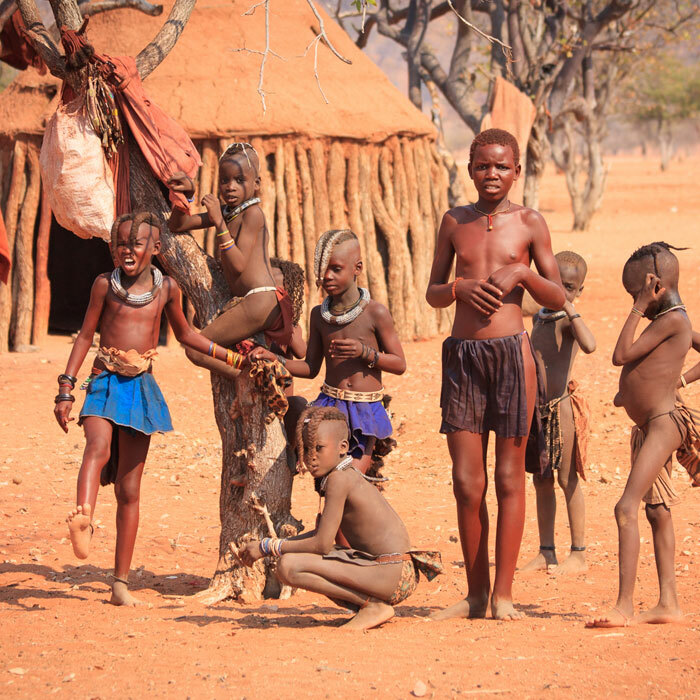 A guided visit to a Himba settlement will give more insight in the way of life and traditions. Opuwo is the capital of the north. It is a real African town where people of all tribes meet each other for trade and pleasure. 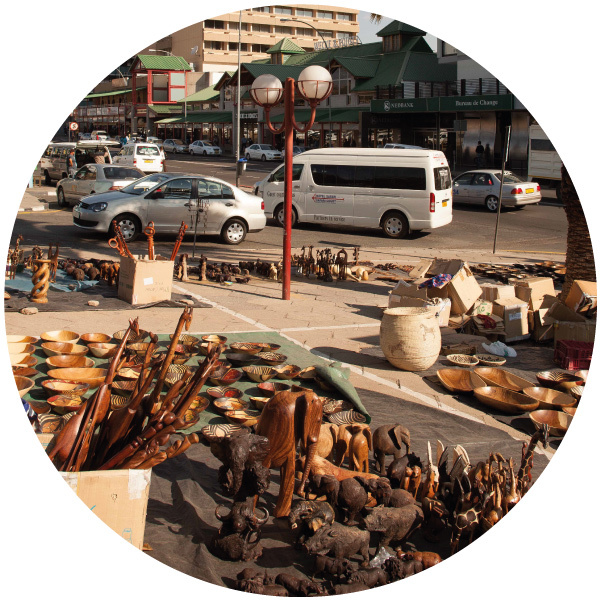 Make a stroll through town and experience the vibrant African atmosphere. Before heading into Etosha National Park, you will stay the night at a Cheetah Farm, where you can have an unforgettable experience when seeing these beautiful cats from close by. With one or two more days to spend, it would be worthwhile to add a visit to the Epupa Falls to your itinerary. See also Route All Round. It is time to take out your binoculars and explore the 22,000 square kilometers of nature within Etosha National Park. Can you spot the lion, cheetah or even the leopard? To see as much as possible from this enormous park, you will be staying at different accommodations. Driving your own safari is unique in Africa! With sunset, make yourself comfortable at one of the park’s waterholes at your accommodation, and see how elephants, giraffes, zebras and antelopes gather to relief themselves from thirst. This is a real unforgettable experience!